This is a nice,semi-detached, recently restored apartment, located in the heart of the village. The building follows the slope of the hill, so on one side it’s on the ground-floor, with a small garden, while, on the other side, it’s on the fifth floor, with two wide terraces overlooking the village and the sea, equipped with dining furniture and sun beds. Just downstairs you can find the main street of the village with shops, restaurants, bars, chemist shop etc. You can completely forget your car , since in a very short distance you can find anything you need: the sea at 300 meters, the cliffside trials at 10 meters, the railway station at 300 meters, the boats docking at the same distance. Within a walking distance of 350 meters you have a garage, into the village parking, included with the apartment. The house is a great pick in Riomaggiore. It is close to the marina and right on the main street. You have a great roof terrace where you can eat and sunbathe (also a small other roof terrace, but we had no use for it). There is a tiny back yard (not well kept though, used mostly for garbage bins), but the kids had some space to play. The apartment consists of one bed room, one living room/second bedroom, two bathrooms, one tiny space for storage (like a hall) by one bathroom and a small kitchen, plus 4 staircases (up to the first floor from the entrance door - up to the second floor - up to the big roof terrace - up to the small roof terrace). :-) It is clean and even the bed sofa is comfy. We got extra shower towels and separate beach towels, which was highly appreciated. You can wash laundry in a laundromat on the main street (4 € wash + 4 € tumble dry, takes about 80 minutes in all). You can buy washing powder (1€) or bring your own. If you use 4 beds you have no sitting room (since the bed sofa is in the living room), which can be a problem if the weather is bad. Also the kitchen is tiny and if you are 4 persons around the table there is no room to walk around it. If you eat on the terrace this is no problem. The kitchen is pretty well equipped, except for wine glasses and serial bowls. There is eg. a Italian coffee brewer (used on the gas stove), electrical coffee machine, microwave oven, tee kettle and toaster. I don't think you need to worry about the number of stairs. Our 4 year old did not complain, and after all if you come to Cinque Terre you are probably prepared to clime a bit. All in all this is a great home base for exploring 5 terre. However, with kids I'd rather recommend Monterosso with a sand beach, promenade and playgrounds. There is a playground also in Riomaggiore on the hill. You reach it by first crossing the main street from the apartment, then take the upper hillside road towards the marina: great views! In Riomaggiore you can swim from the cliffs in the marina (even kids can manage it), the wave breaker, or at the "beach" past the boat dock with huge rocks (hard to walk on). In Manarola you also swim from the rocks in the marina. Vernazza has a small sand beach in its marina and a small beach facing the railroad towards Manarola, but we never went there (could be a rock beach). We stayed at the apartment for 4 nights before we had to unexpectedly return to the UK. The apartment has all you need and was sufficiently large for us. One of the 2 terraces is huge and we enjoyed breakfast outside in the morning and a glass of wine in the evening watching the never ending flow of tourists beneath. Don't expect a lot of charm - but you'll spend most of your time outside anyway as there is plenty to see. Gianfranco, the landlord, has been great. I had a little problem with my second payment and he helped me sort the issue. The garage is very useful so that you don't have to worry about parking fees. Awesome stay! Exactly what we were looking for. Host/owner was prompt communicating pre trip and everything was as promised. The place has a great location, great views convenient to groceries, just a few doors away or into the city by train for five minutes, for bigger shopping triip. Convienient to hiking trails galore. Everything needed and then some, for our month in riomaggiore. Would highly recommend! Lots of steps up to the apt., but ate lots of pasta and needed the exercise. "We (a couple) had a truly wonderful stay at this great authentic apartment with its large, open balcony overlooking the village, hills and sea. The owners were very friendly and welcoming and met us at the station to assist us with our bags. They also gave us a bottle of their home grown local wine for our first evening and washed our clothes at their own apartment below us. The apartment is well equipped and comfortable.It is in the centre of the village and close to everything. Like elsewhere in Cinque Terra you need to be relatively fit because there are lots of stairs and steps to climb and that''s half the fun. We would not hesitate to recommend this apartment in this beautiful village. 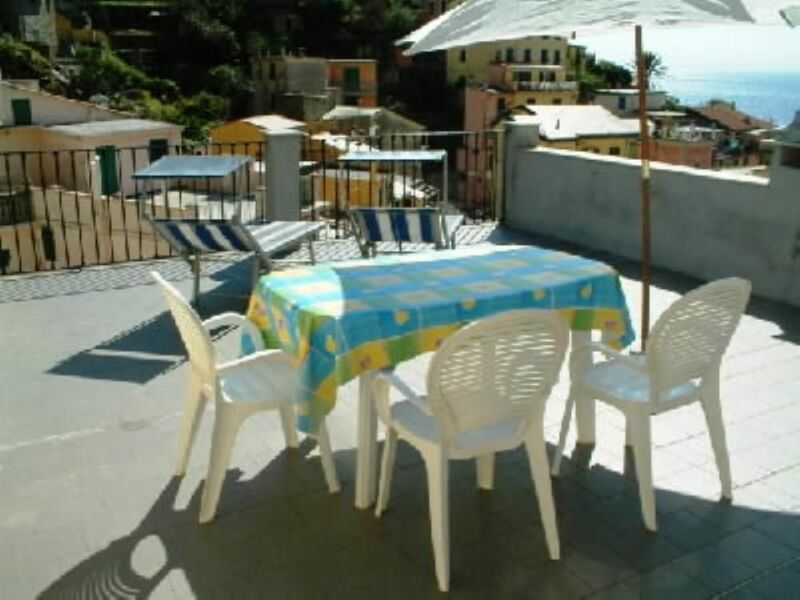 "We loved the wonderful and clean apartment, we could oversee the whole town of Riomaggiore from our great balcony. The Via del Amore, the shops, the station, the restaurants, the bar, the bank, the hills, everything we could hope for was present. We recommend it to everyone. "Such a fantastic stay! We had an amazing time and and a lot of that had to do with this amazing apartment. The views are stunning and you have easy access to the whole town. The kitchen is well equipped and the apartment has anything you will need. The beach in Riomaggiore was a lot of fun... it is a stone beach... and we also enjoyed the easy access to the train station to visit all the other villages. At night we never needed to go out anywhere because the terrace of the apartment was so wonderful. There was always a nice cool breeze and a great view of the water. Over all this is a great choice for a holiday... clean, accessible, and relaxing. Please note that there are lots of stairs and hills everywhere in Riomaggiore... you will get a workout :) The apartment I think is one of the best in the town. And the owner makes sure everything is perfect for you." You can easy reach Riomaggiore from Pisa Airport by railway in about 90-120 minutes. You can catch your train at the Airport, the railway terminal (less than 40 metres of covered walkway). Pisa Airport is served by 20 airlines operating 388 weekly flights to 57 national and international destinations (Summer 2008). Numerous companies offer charter flights from a number of European and non-European destinations. By car : Motor-way exit : La Spezia, follow indications 'Cinque Terre' and after Riomaggiore. Private cars can't enter in the village. The car box is into the village parking at a walking distance of 350 meters. (Text automatically translated) If you would like more information about the location, activities, the attributes of the apartment offered, do not hesitate to write to us.